In a large sauce pan over medium heat, place a tablespoon of olive oil, bacon grease, lard, or coconut oil and coat pan. Saute onion for 3 minutes. Add garlic and spices and continue sauteing for 1 minute. Add beans to pot. I do NOT drain my home-canned beans. I only use a minimal amount of salt in canning and the juice in the can adds flavor on its own to recipes. 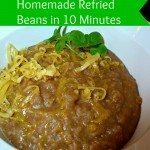 If using store bought beans, drain, rinse, and substitute chicken broth. Bring to a simmer and cook for 5 minutes. Mash with a potato masher or immersion blender. I used a potato masher the first time, but you get a much smoother consistency with this immersion blender. If there’s too much liquid, let it simmer off for a few minutes.